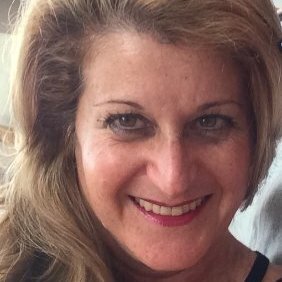 ‍When Lisa and I created our first Melting Pot Food Tour at the Original LA Farmers Market, we were delighted to become acquainted with Jim Cascone and Dan Vance at Huntington Meats. These very kind gentlemen and their great staff have now become like extended family to us by now. In the course of our work together, we've become very proud to extol the virtues of their fabulous offerings, which include Kobe Beef. We thought it would be fun to say a few words about this delicacy. At the end of my story here, instead of a recipe, I'll clue you in on some ways to put Kobe Beef on your table, by not spending as much as you think! Did you know that the Wagyu cattle that produce this extraordinary high-quality meat, dates back to second-century Japan? The breed was introduced as work animals, used in rice cultivation. Beef consumption started becoming more prominent in society, and farm workers began massaging the animals' backsides to yield quality meat. Eventually special herds were breeded in isolation, and feeding techniques became increasingly distinctive. These practices resulted in the meat grade being both superior in marbling, and higher in unsaturated versus saturated fat. Notice in the photograph that the marbling is very much internal, as opposed to the way fat is generally found surrounding the exterior of a cut of meat. The cattle are massaged by hand in Japan, and in Australia, the animals are belt-massaged; this yields a major difference in the price of their respective products! Our guys at Huntington Meats offer an exquisite Kobe "New York style" strip steak, from Australia, for $80/pound. Comparable cuts of meat from Japan cost upwards of $150/pound. 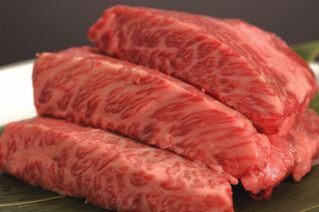 Per our expert butchers, a little Kobe Beef goes a long way, as in, most people do not need to consume an 8-oz steak! Four ounces or even less might be just enough. Dan Vance has told us that it is so rich, to eat a pound would be like eating a pound of butter and he adds, "you can do it, but ..."
If the $80/lb, even for a small piece is too rich a proposition, why not consider their $16.99/pound American Wagyu tri-tip roast? The typical prime beef tri-tip from Harris Ranch, for $6.99/pound is amazing, so this Kobe offering would be out of this world! And finally, if you're just up for an incredibly delicious casual meal, ask for their Australian Wagyu burgers (a one-pound package has 3 burgers), for $8.99. You have my word that you will not be disappointed with any choice! While you're visiting the very best meat counter in all of LA, be sure to ask for preparation recommendations and most importantly ... please tell them Melting Pot Food Tours sent you!